1. Defenseman makes a pass to Center in neutral zone. Both Defensemen setup in the zone for the offensive rush. Their job is to breakup the play and clear the zone. 2. Once Center has puck, C,LW & RW start to enter the zone. 3. 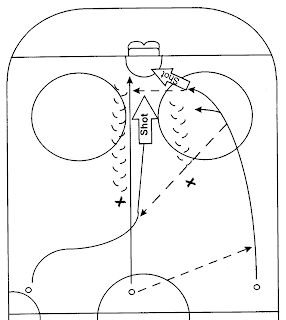 Center makes the first pass to either Winger, then the Center bursts directly to the front of the net. 4. 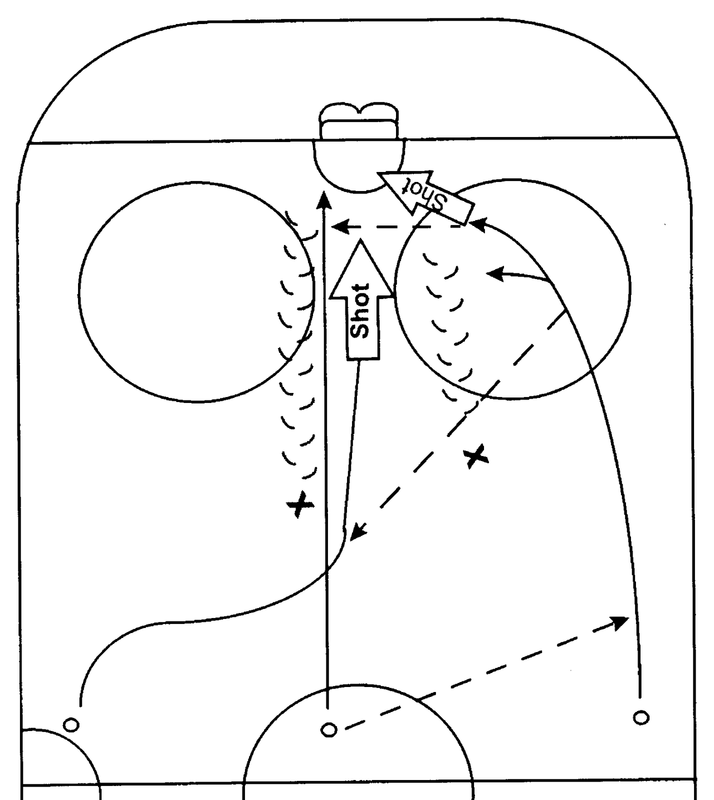 The Winger that received the pass should skate further into the zone on his side and 1.) curl up at the middle of the circle and look to pass to the Off-Winger in the high middle slot, then cut to the net or 2.) If he has a lane to the net to skate hard an shoot. 5. The Off-Winger, should setup in the high middle slot looking for a pass from the other winger. 6. The Off-Winger should take the shot and all should look for a tip-in or rebound. 1. Defensemen: This practices position discipline. It exercises making decisions on either playing the pass or taking the man. 2. Offensemen: This practices position discipline and teamwork with passes. This strategy could be implemented during game play. 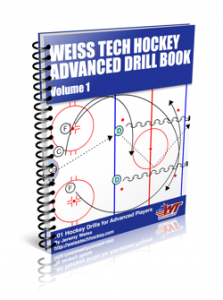 This drill should happen quickly, passes and shots should be quick. This requires good positional knowledge. It's important that the players without the puck get to the net. This pulls the defensemen away from the player in the high middle slot, given him a clear passing lane or shooting lane. Mix up the drill by having the Defensive pass go to one of the Wingers. This causes each player to rethink their role in the drill. As a variation, add a second line in the corner to play a Defensive role. This role should focus on watching the player in front of the net. Thanks to Ducky Restauri for submitting this drill.